Nyasa Big Bullets started their TNM league title defence with a 4-0 win over TN Stars at Kasungu Stadium yesterday as this year’s Super League season started with pomp and colour. Goals from Gomezgani Chirwa, Patrick Phiri and Chiukepo Msowoya’s brace ensured Bullets collected three away points. The visitors took the lead through Chirwa in the 17th minute. Phiri cushioned the lead in the 30th minute after TN Stars defenders failed to clear a throw-in by Chirwa while Msowoya scored his brace in the 67th minute in and added time. It was a great start by the defending champions as the goal came after both teams had wasted scoring chances between them. TN Stars hitmen Stain Davie and China Chirwa let their team down when they missed chances. Prior to the start of the game nyau dancers paraded the trophy while models carried flags of all the league’s 16 teams. The Salvation Army Band was also accorded a round of applause from the overcapacity ground. 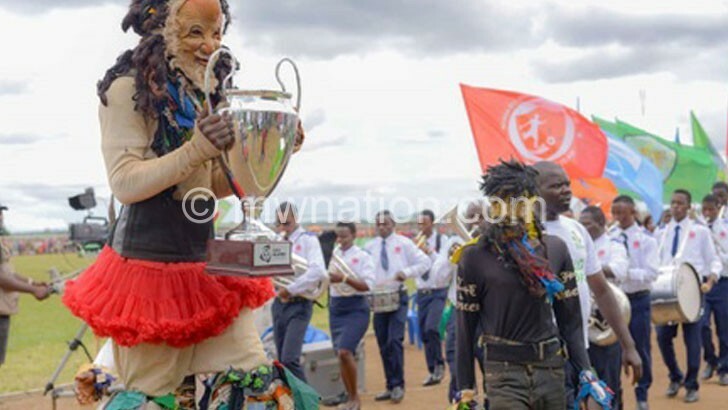 There were more cheers when the most popular towering nyau (makanja) went to the VIP section to hand over the trophy to a surprised but happy TNM plc chief executive officer Michiel Buitelaar. TN Stars coach Meke Mwase said they failed to withstand a good side, especially in the second-half. Bullets’ Zimbabwean coach Callisto Pasuwa said it was good start to the campaign. “We pressed them hard and we knew they don’t have the experience, and they conceded. It was a good performance. Had we been more clinical, the margin could have been bigger. It’s a good start,” he said. At Kamuzu Stadium, Be Forward Wanderers were in no compromising mood as they thrashed Mzuni 5-0 in a one-sided affair. Striker Babatunde Adepoje proved worth of his K7 million record signing-on fee after steering the Nomads to a deserved victory over the Northern Region side. The Nigerian scored a brace, his second at the Lali Lubani outfit, after scoring another two in Chifundo Charity Shield against his former club Masters Security. Defender Harry Nyirenda also scored a brace as the Nomads announced their intention to reclaim the league which slipped through their fingers last season. Nyirenda put the Nomads ahead just 15 minutes into the match, heading in from a corner. The Nomads were dealt a blow when their defence pillar Lucky Malata limped off the field due to an injury. He was replaced by Bongani Kayipa. Babatunde headed in the second goal for Wanderers at half the hour mark, from a Mike Kaziputa cross. A rain drizzle saw the two sides going for half-time recess. But the rain did not stop the Nomads from dishing out their best in the second stanza. Babatunde headed into the far top angle for the third for Wanderers in the 54th minute after another fine cross from Kaziputa, who had a grand game. But the winger’s exciting afternoon ended abruptly after an injury and he was replaced by new signing Rabson Richard. Nyirenda completed his own brace in the 71st minute from another header. Zicco Mkanda netted the fifth from a set-piece following a foul on substitute Francis Nkonda, to complete the afternoon’s goals galore. Wanderers coach Bob Mpinganjira hailed his charges for a good start, saying it would help to build the team’s morale. “It was a good game. It’s always good to start with a win. Winning 5-0 even makes it much better,” he said. Khuda Muyaba’s hat-trick was enough to save Silver Strikers from Karonga United’s The Crocodiles as the match ended 2-3 in favour of the Bankers. It was a game full of excitement as Karonga United took control for the bigger part of the action. Muyaba scored the first goal within five minutes, the second in the 63rd minute and completed his hat-trick in added time. At 2-0 down, Karonga United did not give up as Peter Mselema scored twice to level the Bankers. After the win against Karonga, Silver will face Chitipa United today. Speaking in a post-match interview, Silver Strikers team manager Hellings Mwakasungula hailed his charges for the good show, saying Karonga United were not an easy ride. “Karonga United were tough, they were organised as well. All in all, the players fought to the end and we earned the much needed three points. This is a good start,” he said. On his part, Karonga United coach Dan Dzimkambani said they played well only that the defence errors let them down. “It was just some defence errors that led to our loss otherwise we dominated the better part of the game,” he said.